Another Baguio Trip this year with my Tree Top Adventure Team headed by Ms. Grace, this time for two nights and three days. After our 5 hours road trip going to Baguio, the Summer Capital of the Philippines, we go straight to Azalea Residences Hotel our hotel sponsor for our three days stay in Baguio. Upon arrival, it was actually 7 pm already and we proceed to the reception desk to check-in. After the check-in, we then go to our respective room hotel staff carrying out our bag using their push cart, our room resided in third floor. Then we did checked the rooms and it was so nice and look like a serviced apartment. Our room called Two Bedroom Apartment Suite, room one is the master bed room with own comfort room and the other one is the small one but there is a common bathroom which is huge also. I will detail what’s inside in our room later but for now what we did after checking our assigned room we then have a group picture with the Azalea Residences Team. After that, we proceed to their restaurant called Tradisyon we're we tasted their hot pot buffet, this is my first time to try hot pot buffet and I really enjoy how to cook our food and how they mixed all the ingredients. The whole pot was divided so that you can separate if you want spicy or just a normal hot pot soup. We are very glad that all the staff are very accommodating, they help us and teach us how to prepare our hot pot. At first I enjoyed the spicy but after I ate the sili, that was really spicy and then I decided to get soup in normal hot pot which is not spicy. Before we end up our dinner, we asked the staff of Azalea Residence to take us a group picture and then we went up in our room and take some rest before we go night out to check the popular Night Market in Baguio City. After some rest, we go down and meet the group in the hotel lobby, what I noticed to all the staff in Azalea Residences is that they are always smile at you that give you a good vibes every time you enter or went out in the hotel. Then we ride in a taxi to go to Night Market, when we arrived, we then bought some food like boiled corn with cheese and milk and some bought dinakdakan. Then we walked and checked all the things that Night Market offered like, used branded bags, clothes, shoes and some brand new things and souvenirs. Every time I visited Baguio and checked their Night Market it was always jumped pack. We did not buy anything except for the food and then we have decided to tour around Burnham Park and take some photos including our jump shots :) . That time we already feel hungry, we decided to eat at Good Taste one of the popular 24/7 restaurant in Baguio. Then after we ate we walked around to check some other places that are open that time. After we feel that we are all tired, we decided to go back in Azalea Residences at take some rest because we have a call time tomorrow at 8 AM for the Tree Top Adventure press conference. The next day, before we went to the press conference we then first eat breakfast at Azalea Residences and we did not know that they have an extension restaurant next to common Tradisyon restaurant which I think they use it if they have events like wedding, bithdays or party. 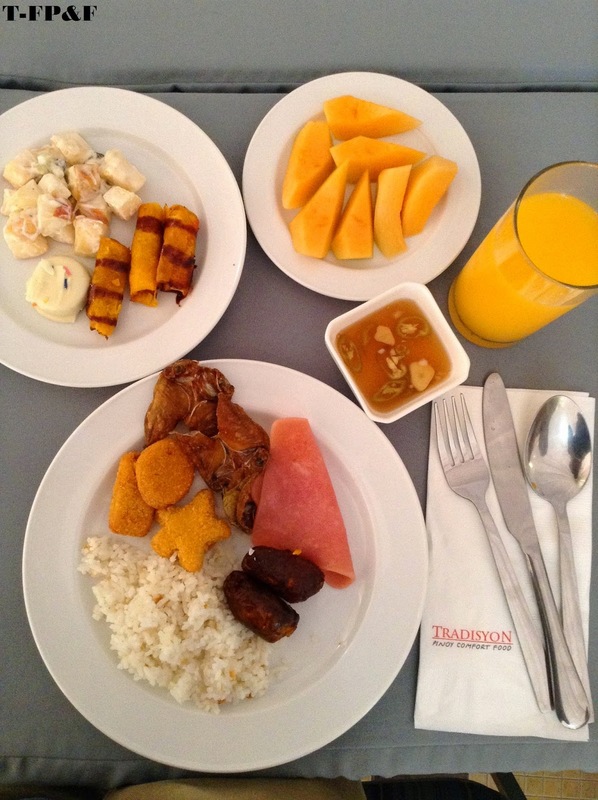 What we have in our breakfast is the common Pinoy dishes like longanisa, corned beef, friend danggit, hotdog, egg, sausage and a lot more. After that we then go to the Tree Top Adventure in Camp John Hay. Then after the press conference and our extreme adventure in Tree Top Adventure, we decided to visit some places in Baguio City like PMA, Mines View and bought delicacies in Good Shepherds and in Baguio Public Market. After that we then go back to our hotel at Azalea Residences, we go to our room to put all the things that we bought before we go to the hotel restaurant for our dinner. Out dinner that night was pasta and pizza buffet with some desserts, Pizza was so good like what we ate which is the pizza longainisa, for the pasta you have to choose all the ingredients you want and they will prepare it for you. For me I choose the fettuccine pasta and white sauce with mushroom, cheese. For my dessert, I get some tiramisu dessert and it was good, not so sweet. That night was a long day for us, some decided to stay at their room and some decided to go out to check other places in Baguio at night. That was our second day in Baguio and in Azalea Residences, oh I forgot that when we checked our room that night, we have some small box of sweets in our bed from Azalea Residences with nice messages and weather update, that was so sweet and we all loved it. In our last day, we then have our breakfast before we go the room of Azalea Residences to take some photos of the whole apartment suite. In their two bedroom apartment suite, it has two bedrooms, living room, dining area, balcony, and bathroom. Living room, they have TV sets, a comfortable sala sets and a nice and cool chair. All their TV has cable connection. Dining area, they have a set of cooking equipment’s, refrigerator, high table and chairs like in a bar, and a lot more. Bathroom, a big bathroom with hot/cold shower. When you check-in in Azalea Residences, they have a free wifi and they give you the password immidaitely upon check-in. Thanks Azalea Residences for accommodating us for three days, hope we are still welcome in the coming years and events. We are happy that we're able to experience the best place to stay and relax in Baguio City. Nice post Ace! Thank you for joining me at the PMA ;) You know how much I love the visit that place. See you in our next trip.